If we’ve learned anything from this election cycle it’s that lots of people are long on opinions and short on facts. We’ve also unearthed some curious theories. That mere intelligence trumps actual experience. That promises to get tough are better than an actual plan. That most of success in life is about cutting “great deals, tremendous deals”. And that, when in doubt, let’s just let fear rule the roost. That those that have only flown over the battlefield know how to win the war. That folks who have never suffered from institutional racism know exactly how to lift marginalized communities out of discrimination, poverty and violence. That people who have won the ovarian lottery–and have likely never spent a minute walking in the shoes of those much less fortunate–can confidently say that “those people” just need to pull themselves up by their bootstraps. Moreover, there is no need for further study, or to be even mildly inquisitive, because our minds are already made up. It’s always easier to wage an air war, to be the critic, to shout encouragement from the stands. But then there’s that pesky little problem that it doesn’t really accomplish anything. Much of the time, what we need–what I need–is to first get curious. Once we think we have all the answers there is a pretty good chance we’re wrong. A passionate curiosity releases us from ego and creates the potential for something far more spacious, real and connected. Most importantly, it gives us the information we need for good decision-making. It turns out facts matter. The second step is to get proximate, to get out of our comfort zone and immerse ourselves not only in the facts, figures and issues, but the people, the emotion and, yes, our hearts. h/t to Dr. Heather Hackmann for helping inspire this post. Pick just about any cause we claim to be passionate about. Happiness. Innovation. Social justice. Immigration reform. Climate change. Being a better parent. Eating more healthfully. Whatever floats your boat. If you are anything like me, it’s often easier to be getting ready to go do something meaningful rather than wholeheartedly embrace that thing I claim to desperately want. If I think things through thoroughly, I tell myself, the outcome I want will be assured. If I research just a little bit more, I will be perfectly prepared when the time is right. But there is no perfect time. We always have to start before we are ready. We have to do the work, rather than just study the work. If we want to swim, we need to get wet. Our own version of heaven is here right now, in this present moment, if we are willing to just see it, accept it and embrace it fully. We can always be in pursuit of happiness or–and here’s a crazy idea–we can actually try being happy. There are a lot of things I say that I want to see changed. About the world. About myself. And probably about you, if I’m honest. I haven’t exactly been shy about sharing my exhortations about innovation, leadership, new ways to market, my desire for a more compassionate universe, the urgent need for creative solutions to societal problems and on and on. I do this in small group conversations, from a stage, on my blogs and through various social media. I’m often that annoying guy who posts motivational sayings on Facebook or Twitter. I regularly share inspiring stories of transformation or enlightenment–particularly if they involve me. I’ve rarely met a Buddha or Maya Angelou quotation that I didn’t like. Yes, I say quite a bit. I’ve intellectualized all manner of approaches, frameworks and models that hold the potential for personal, organizational and societal transformation. Unfortunately, I’m rarely that good at the doing part. If you are anything like me, it’s easy to take the moral high ground from the cocoon of social media or by hiding behind the mutually reinforcing beliefs of our various tribes. It’s simple enough to nod self-righteously in the warm bath of confirmation bias and pontificate endlessly about what everyone else needs to do. We say we want a revolution. And yeah, we’d all love to see the plan. But at long last I’m awakening to the reality that beliefs are cheap currency. That knowing something is just the warming up part for the practice of doing. That planning is helpful, but extremely over-rated. The world doesn’t have a shortage of well-intentioned people. Awareness of our problems is rarely the scarce commodity. What we need is a lot more action. We need to get proximate and take the plunge. I hope you’ll join me. What better time than now? Social media has done a lot of things–some of it positive and profound. As social media has accelerated the dissemination of information, connected people across the globe in previously unimagined ways and literally fomented revolutions, it’s also provided a dramatically amplified megaphone for the critic, the judge, the troll and those long on opinion and short on facts. In some cases, it’s given a platform to those who frankly don’t deserve it. If you have a reasonable number of “friends” on Facebook–or follow even a moderately curated set of folks on Twitter–you regularly encounter people who are outraged at some situation in the world, take to bashing a hapless politician’s most recent gaffe, flog absurd conspiracy theories or merely engage in non-sensical rants. Conversely, if you are anything like me, you frequently “like” numerous do-gooder causes and retweet items that coincide with strongly held beliefs and values. After all, there is so much the world needs to know and it reinforces the idea that I’m a worthy person by promoting what I see as my good works and holier-than-thou virtues. It’s not hard to sense the strength of our convictions. Our enthusiasm is evident. Often, our world is clearly drawn in good or evil, black or white. And it’s obvious which side we’re on. But so what? Who cares? Just as we’d never directly confront that “idiot” driver who cut us off–but have absolutely no problem cursing them from the safety our car’s interior–we find it so very easy to be the voice of moral authority and the king or queen of self-righteousness from the protective cocoon of our social media account. 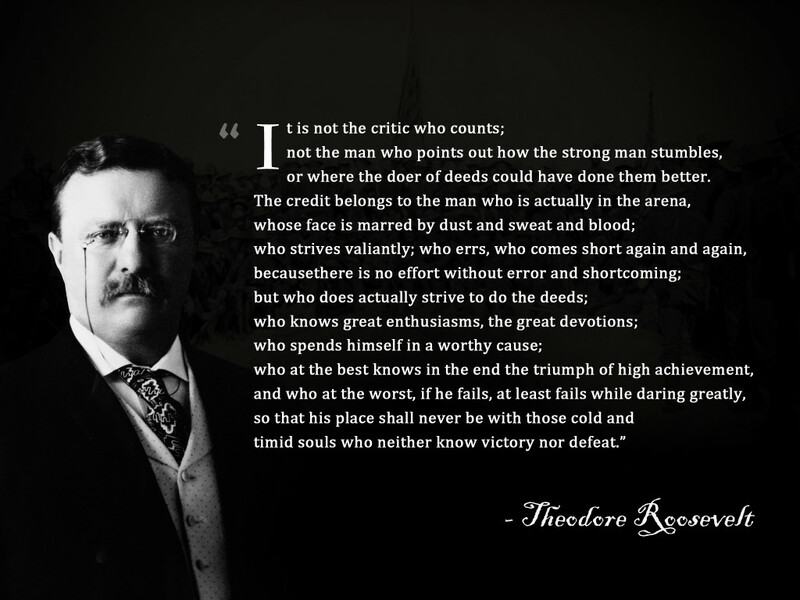 Teddy Roosevelt famously reminds us that “it is not the critic who counts”, that the credit belongs to those that actually do something. Passion is nice, but it’s the willingness to take action that ultimately makes the difference. Having tools like social media to express our displeasure to more and more people and to relentlessly hone the image of who we hope to be in the world ultimately means very little. Without putting ourselves out there, doing the work, getting proximate, we’re all just a bunch of passionate bystanders. Let’s connect in the arena, rather than on the screen or from the stands. 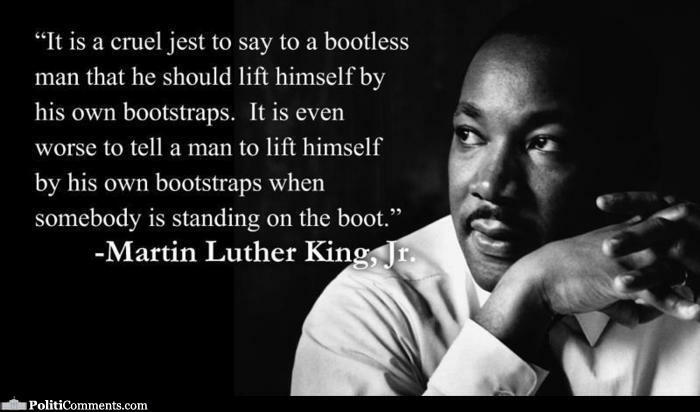 Politicians like to talk about avoiding “boots on the ground”–and for good reason. A so-called air war has the promise of victory with little muss or fuss. No uncomfortable and sad videos of bodies returning home in flag-draped caskets. No awkward Presidential calls to family members. No VA hospitals filled with the maimed. At least not on our side. Air wars allow us to fly above the fray. To accomplish our objectives indirectly. To do away with actual confrontation. Death comes from above instead of face-to-face. I’m hardly a military strategist. I’ve never served in the Armed Forces. Maybe an air war is the best choice in today’s world of combat, under our present set of circumstances. Back in our every day world, I see plenty of people waging their own versions of an air war. They pontificate on ways to fix the world’s problems from the sidelines instead of being in the arena. They think all the answers will be found at a conference or in a book. They write checks to assuage their guilt. They seem to believe a Facebook post can change the world. They lob in the occasional emotional grenade from afar, rather than sit in actual vulnerability. And yeah, I’ve been that guy. And yeah, that is still my default mechanism far too often (can we let that be our little secret?). It’s far easier to sit on one side of town and opine on what everyone else needs to do about the other side of town. And I suspect we all know that passive aggressiveness may be good for our short-term dopamine levels, but rarely actually accomplishes anything positive. Let’s face it, critics don’t win the awards and cheerleaders don’t win the game. The fact is, plain and simple, the hard, uncomfortable work–the work that matters– requires us to get proximate, to put our figurative and literal boots on the ground, to get dirty, to fall and get back up again. Rinse and repeat. We can extend a lesson from the Big Book of Alcoholics Anonymous and acknowledge that despite our hopes there is no easier and softer way. I don’t know about you, but I have done some amazing things in my life. Now to be fair, most of these brilliant accomplishments and experiences have never actually left the confines of my mind. Quite a few were grand solutions posited in random conversations (some might even call them “rants”). Others were insightful and meaningful criticisms lofted from the safety of a Facebook comment or tweet. Some were glorious adventures acted out solely through internet research. Still others were “made real” through this blog back when, it would seem, my irony detector was set on “simmer”. It also turns out that I’m surprisingly good at making (and mulling over) lists. You know, options I’m exploring. Ideas I’m studying. Things I’ll get around to some day. The myriad changes I want to see in the world. Most never make it off the page or out of my head. One of my most vivid memories comes from November of 2003 when I remember sitting in a chair next to my father’s hospital bed. His speech was more than a little bit muddled from the morphine drip in his arm, but he carefully and slowly shared a robust list of things he had always meant to do and places he had hoped to visit. It was an inspiring, thoughtful and heartfelt list. Alas, he never made it out of that bed again. He died later that week. Too often, it would seem, the disconnect between where our hearts point us and what our actions actually turn out to be can be vast. We tell ourselves there will be a better time. We think we can win the game from the safety of the stands. We say we are afraid of dying but then it occurs to us that perhaps we’ve never truly lived. We say we’ll begin where we’re ready, whatever the hell that means. If you wanna get strong, go to the gym. …the point is: where the body goes, the spirit follows. If you want to paint, don’t agonize, don’t iconize, don’t self-hypnotize. Shut up and get into the studio. Once your physical envelope is standing before the easel, your heart and mind will follow. This post originally appeared on http://www.stevenpdennis.com New content will appear on this new blog very soon.